When: September 15, 2018, 9 am – 1 pm, rain or shine! The Somerville Garden Club holds one of the best plant sales in the Boston area. Club members divide and donate time-tested favorites as well as plants they have just discovered. Discover the perfect plant to enliven your garden or windowsill at this popular yearly sale. Perennials for sun and shade, herbs, shrubs, groundcovers, plus a wide variety of house plants will be featured. Choose from hundreds of plants donated by Somerville Garden Club members and friends. Visit the Connoisseur Table for that unique specimen or find a tried-and-true favorite—there’s something for everyone! Horticultural books, decorative containers, and garden tools will also be for sale. Experienced gardeners will be available to answer questions and assist with plant selections. And the littlest gardener will enjoy the Children’s Table. 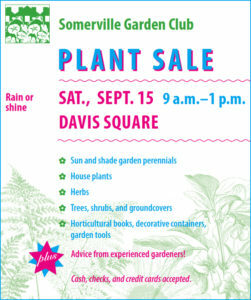 Proceeds benefit the all-volunteer, non-profit Somerville Garden Club. Put the plants (including houseplants) in an appropriate size pot, so that the roots aren’t sticking out of the pot. Pot up plants in August to ensure the roots will have settled in the soil, rather than coming out of the pot bare root. Add potting soil as needed. Water well but do not fertilize. Brush soil from the pot and wash the pot so it presents well. Cut off any wilted, browned or yellow foliage and cut back stems that have already bloomed so the plant looks neat. Each plant will need a label noting the following. Don’t hesitate to also note any particularly appealing characteristics! For example, we will be adding a ‘native’ sticker to plants that are native to North America. Help us out by noting that in the comments if you know your plant’s origins.